The integrity of the judge who handed out a negative judgment to the Usenet community FTD has been called into doubt. After it became apparent that the lawyer representing the movie studio and the judge were giving copyright courses together, the Pirate Party is hinting at a corruption scandal. Last week movie studio Eyeworks won its lawsuit against Dutch Usenet community FTD. In the verdict, Judge Chris Hensen ruled that by allowing users to talk about a movie’s location on Usenet, FTD was effectively publishing the movie as if they had actually hosted it on their own servers. The verdict was welcomed by local anti-piracy outfit BREIN, but several copyright lawyers and opponents at the other end of the copyright spectrum have heavily criticized it. The ruling sets a dangerous precedent for future cases and may very well lead to more control and censorship by the pro-copyright lobby at the expense of people’s freedoms, they argued. Aside from the critique on the decision itself, the integrity of the judge who handed out the verdict has also been called into question. Immediately after the verdict people involved with the Dutch Pirate Party, which is on the ballot of tomorrow’s elections, pointed out that the judge might not be as objective as he could be. 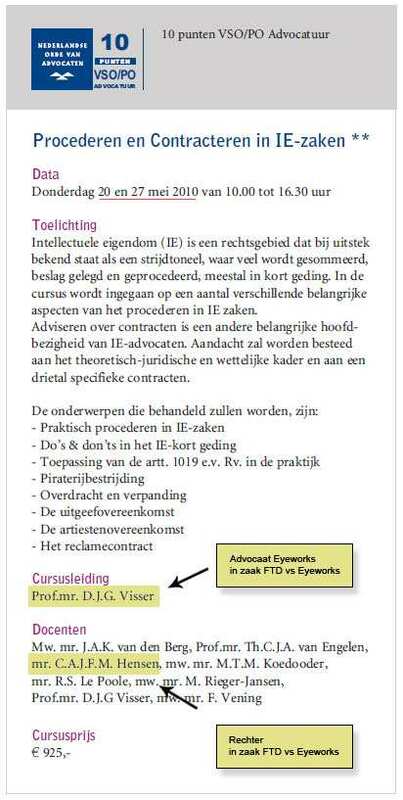 It turns out that the movie company lawyer Dirk Visser, the same person who also scored a victory for BREIN against Mininova, has been organizing a course for copyright specialists where Judge Hensen was once of the teachers. This prompted the Pirate Party politicians to doubt the objectiveness of the judge. Sweden’s Pirate Party leader Rick Falkvinge, who’s currently supporting his Dutch colleagues in the election run, has been the most vocal about the issue. “Every time something like this happens, you think the copyright lobby has fallen to a moral rock bottom. Then as soon as you turn your back, they take out a jackhammer and start digging.” Falkvinge added. “I expect this will boost support for the Dutch Piratenpartij, and for good reason. Today’s politicians need to learn that their seats aren’t taken for granted,” Falkvinge added. In the current polls the Dutch Pirate Party is still lacking enough support to be able to scoop a seat at the local parliament, but there’s still a day to go for them. Undoubtedly, stories about conspiring copyright lobbyists and possible biased judges may help to give that final push. Despite the election outcome, FTD announced today that it will appeal the verdict of the case. They don’t intend to follow up the bias claims, FTD’s lawyer told TorrentFreak.